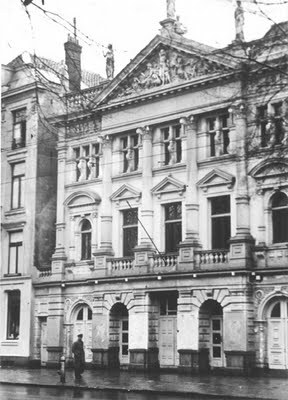 The Hollandse Schouwburg was Amsterdam’s premier venue for concerts and shows before the Nazis occupied Holland in 1940. By 1942 it was turned into a detention and deportation center for Amsterdam’s Jews. Most who went through the Schouwburg would end being transported to Auschwitz and Sobibor. This entry was posted on Tuesday, March 20th, 2012 at 12:30 am	and tagged with Amsterdam's, Auschwitz, Holland in 1940, Hollandse Schouwburg, Nazis, Sobibor and posted in Uncategorized. You can follow any responses to this entry through the RSS 2.0 feed.